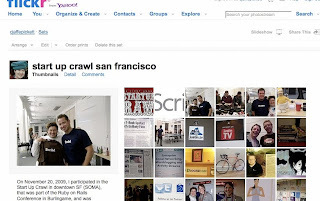 In the previous post, I showed how I used 30 images from the San Francisco Start Up Crawl to make an Animoto video. From start to finish, it took about one and a half hours to complete, and that included adding descriptive text for the opening, choosing the music, arranging the order of the images, and the time it took the video to render. In this post, I am using the same 30 images in a different way. I created a "Set" in Flickr, which allowed me to order the photos, create titles and tags, set the date for all the images, tag specific individuals and e-mail confirmations to them, and create a slide show that I can share via e mail and social networks to others. The total time from start to finish was also about an hour and a half, the same amount of time as the Animoto video. While I had uploaded photos before to Flickr, there were some new features I hadn't used yet that I experimented with. I liked the option to tag a friend in the photos and then e-mail them a confirmation, but the interface for this was a bit awkward - you never saw what the recipient would be confirming, or how it was worded. I also like many aspects of the slide show - users can control the speed of the show, and also make it full screen. Problematic is the area where the captions type pops up. Instead of being off the the side, it appear on the top of the photo and inevitably covers your photo subject. Very awkward. Another good feature is a new option to print and create photo projects, such as calendars, wall art, collages, and cards, through a partnership with snapfish. I didn't try out any of these features yet, but would have liked to have seen a t-shirt and bag option. When organizing and editing photos, Flickr can also be a bit confusing, and I have heard this complaint before. It's not totally clear what the difference between a "Batch" and a "Set" is, and if you don't have the specific set you're working on higlighted, you can accidentally make universal changes to things like the date, time and place the photos were taken, that will affect all the photos in your stream. Also, there is redundancy in many of the menus, and it's confusing where is the best place to add titles, captions, and other descriptions since every screen seems to offer this option. As far as telling the story, I found myself enjoying writing up the captions and providing more backstory then I obviously would have for the Animoto video. Writing the captions was good experience in giving the audience just enough information to make it interesting. What is your impression of the Animoto vs the Flickr slideshow? Which do you think tells a more effective story? In my third and final post, I'll be using the same 30 images to create an IMovie and of course, taking note of the overall length of time the project takes and how the storytelling is once again affected.